The advantage of spending the summer in one area, is getting to watch the seasons changing. This year, I made a point of taking a picture of Mount Moran from Oxbow Bend, every few weeks while we were here in Grand Teton National Park in Wyoming. It’s interesting to see how the mountain changes. I took these photos with the same camera, and did not edit them. Our first view this year was on May 14, 2018. The mountains are still snow-covered and the Aspen trees are starting to bloom. By June 6, the mountains still have snow, but everything has greened up nicely. By the end of June, the snow has continued to melt, and the wildflowers are starting to bloom. The trees seemed to have turned a darker shade of green. By the end of July, a small amount of snow remains on the peaks. The skillet glacier on Mount Moran is more in view. The locals refer to it as the Jimmy Hendrix guitar. The fires from California started to bring a haze over the mountains in August. The view is not as “sharp” as July, as a result of the haze. We had our first winter storm watch of the season on August 28, at altitudes above 9,000 feet. So the next day, we ventured into the park to see the tops of the mountains with a fresh coat of snow! The snow cleared out a lot of the haze, which brought the mountains back into focus. On September 8, the leaves were starting to change in the park, but not yet in the Oxbow Bend area. The bushes on the right have started to turn, however. It was a late afternoon photo, with haze over the mountains, from a new fire 60 miles south of the park. By September 19, the leaves on the Aspen trees were turning yellow, and the haze was not too visible. Fall has arrived in the Tetons, and the park is bursting with visitors for the wildlife and colors. On September 25, the color in the bushes on the right has faded, but more trees are showing color, and with the cool nights, the mountains are clear. On our last day of work, October 3, we made one last quick trip through the park. The final “green” trees, have turned yellow and orange. The leaves on the trees to the right, have mostly fallen off. The ducks and geese are migrating through on the way south. Good-bye Wyoming! See you next year…. I would like to say that it’s hard to believe the summer season here at Luton’s Teton Cabins is almost over but when you wake and it is a brisk 17 degrees outside, it just slaps you in the face and reminds you to start packing up the 5th wheel! This has been a very busy month, as the cabins are full of guests, enjoying the active wildlife and fall colors in the park. We have also had our own visitors as well, which we always enjoy. Mike and Sue, our good friends from college, drove out from Wisconsin for a short visit. Makena enjoyed showing them her favorite off-leash walking trail! Gary and Julia, Dan’s brother and sister-in-law, also flew in for a few days to visit. It was Gary’s 60th birthday! He informed us that we have to stop referring to this time of the year as the “newlyweds and nearly-deads” and add in the “empty nesters” as well! We scheduled a float trip down the Snake River in Grand Teton National Park, and they both enjoyed the relaxing 8-mile evening float. 60 and still going strong!! With both Mike and Sue, and Gary and Julia, we did our best to play tour guides of both Yellowstone and Grand Teton National Park. With only limited time to explore, we did hit the high points. Of course, it is Wyoming, and late September, so it’s not unusual to encounter a quick snow storm at Yellowstone! Both Mike and Sue, as well as Gary and Julia, took some time to enjoy the beautiful sunsets that we get to watch right here at Luton’s Cabins. With the cooler nights, we have been getting a lot of colorful ones. We always enjoy having visitors, and are more than happy to show off “our parks” to others. We have already committed to coming back to Luton’s next year, as well as everyone else that works here. Brad and Joanne said this is the first time that all their employees will be returning the following season. They are such wonderful people to work for. So if you will be out in Wyoming next summer, let us know!! Dan and Al have been busy fishing this summer, and have caught their limit many times. We have had two potluck meals with everyone where they grilled the fish. These are native cutthroat trout – they look like a rainbow trout with the exception of an orange line under their mouth. I had a bit of an adventure with a wasp nest. Makena was out on her leash and got stuck under one of the jacks on the fifth wheel. When I crawled under to get her unstuck, I came face to face with this bowling ball sized nest!! Dan has had an allergic reaction to bees in the past, so it was my job to get rid of this thing. I waited until the morning when it was in the 30’s, so the wasps were less active, and used an entire can of wasp spray, plus I had a shovel to scoop up the nest and throw it into the creek behind our 5th wheel. Now we look under the slides every week to make sure they don’t rebuild! It’s one of the disadvantages of being in the same place for a long period of time. We are ready for new adventures, and look forward to hitching up and heading south next week. We will have about 10 days to get to Yuma, Arizona, where we will be working at Westwind RV and Golf Resort. It will be our first time working at a campground. With all new adventures, I will have more to blog about. The other morning, the moon was setting West behind the Tetons, as the sun was rising in East. It made for a colorful morning photo. 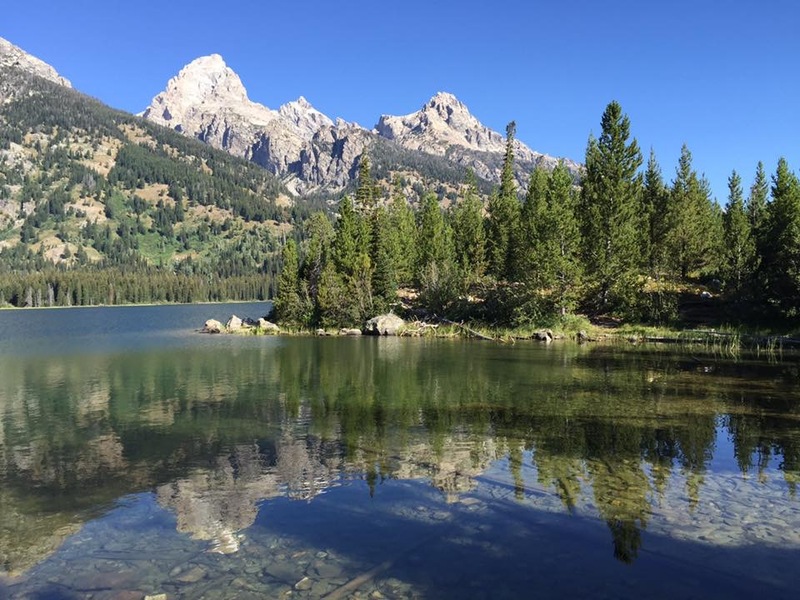 While Grand Teton National Park offers many excellent hiking trails for all levels of abilities, we have decided this summer to spend more time away from the crowds on the trails of the US Forest Service. The trails, while still being well-maintained and most have vault toilets near the trail head (something that I prefer), are seldom used by the tourists. If you only have a limited amount of time in the park, most visitors will do the “popular” park trails. But if you have more time in an area, or want a more “serene” experience, then check out the forest service trails. Our first hike, with our co-workers Shawn and Erin, was a trailhead behind Togwotee Mountain Lodge, at an elevation of 8654 feet. Brad, our boss and life-long resident in this area, recommended this trail to us, and said it’s “about 6 miles,” and “all downhill.” Since this was going to be a one-way, downhill hike, we left one vehicle down near Turpin Meadows, and took the other car up to Togwotee. The wildflowers were in full bloom, which made the hike extra special. Even the vault toilet at the trailhead was surrounded by flowers. The Grand Tetons, about 45 miles away, are peeking out over the forest, with wildflowers covering the hills. We made it down to the river. You can see where we started, by the red X in the photo. Dan checked his elevation app that he has on his phone, and it said we were down to 6800 feet, from the 8600 feet when we started. But once we made it down to the river, we realized the trail did not follow along the river, but instead went straight up a hill. Brad and Joanne don’t go hiking, they take their horses and go riding in the forest. That should have been our clue when he said it was all downhill…..! All together, the “6 mile, all downhill” hike that Brad recommended, was 8 1/4 miles, with 1800 feet downhill, followed by 1000 feet uphill and another 1000 feet downhill. When we mentioned to Brad about the uphill portion, he said “oh yeah, but it’s only 20 minutes,” to which we replied “if you’re on a horse!” But the spectacular views, and seeing the wildflowers in full bloom, was well worth it. And we were the only ones on this hike. We had the forest to ourselves! Dan and I spent another one of our off days taking advantage of another forest service hike, at Brooks Lake, which is part of the Continental Divide Trail. The loop trail starts at an elevation of 9100 feet, and is relatively flat for the first 1/2 mile. Then you climb 700 feet in one mile, which may not sound like much, but when you are starting out at such a high elevation to begin with, it really gets your heart rate elevated. We had to go up and over the tree line in the photo below. We took it slow, and stopped several times. Dan asked if I wanted to turn around, but this time we knew that once we made it to the top, the remaining five miles would be relatively easy. After 40 minutes, we finally made it to the top. Then it was just a another mile until we got our first view of Upper Jade Lake, which was spectacular. The trail gradually descended down to the lake. The wildflowers were just past their peak, but still pretty. We had to cross over the river between upper and lower Jade Lake, and the trail wound around lower Jade Lake. The trail crossed over the river two more times, before going out into a meadow for the last mile of the trail. I managed to make three of the four river crossings without a problem. On the last crossing, one of the rocks that I stepped on moved, and down I went into the river! The water was cold, but it was so hot out, it was actually refreshing. And on a positive note, I discovered the hiking “fanny pack” that I use, is waterproof, as everything inside the bag was dry. Since the last mile was out in the open, I was able to dry out a little on the way back to the truck. We had a nice view of Brooks Lake on the way back. Our truck was parked on the other side of the lake. I usually bring a change of shoes/socks when we hike, but from now on, it will include a complete change of clothes! We continue to be busy at Luton’s Teton Cabins, at least for another week. Then we enter the “change-over” of the summer, when kids are back to school, so the family vacations end, and the “newlyweds and nearly deads” begin their vacations. We will have about one week when our occupancy is light. It will be a much appreciated break, as our cabins are full for the month of September. The downtime will give us time to clean and prepare the truck and fifth wheel for our trip to Arizona for the winter.